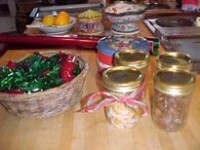 Here are three easy recipes for holiday gifts— the orange peels are a delicious after-dinner treat; the nuts can be used in salads, in desserts or eaten alone; and the sugar plums are an old-fashioned treat! Some years I make all three and give them in gifts in pretty bowls or baskets. Happy Holiday Cooking from Tante Marie! Wash the oranges with soap and water. 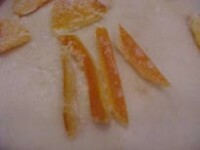 With a sharp knife, remove the peel in four pieces from the oranges and with a metal spoon scrape out any pulp. 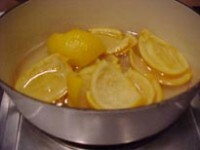 Simmer the orange peel in 2 qts. 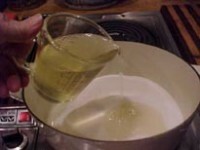 water in a large saucepan for 30 to 40 minutes, or until tender. Drain and reserve the liquid. 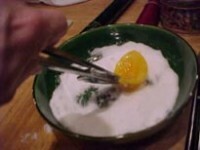 Remove each piece of peel with tongs, shake off excess liquid and dip both sides in the remaining sugar. Cool on wire racks. Let dry 24 hours. 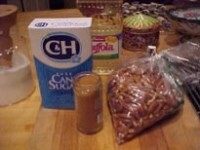 Then, with scissors, cut into 1/2-inch wide stips and store covered in the refrigerator. Note: If you squeeze your own orange juice you can save the peels (they freeze well) and use them to make the candied peel. 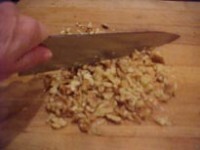 To make the nuts, if they have skins that are easily removed, rub off the skins. 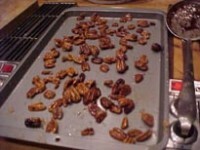 Place the nuts in a pan with 1 qt. water and bring to a boil. 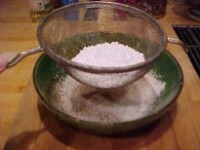 Meanwhile, sift the sugar and spices into a shallow bowl. 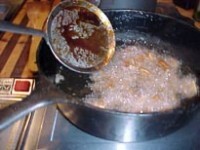 Remove the nuts from heat, drain carefully, and immediately toss in the sugar mixture. 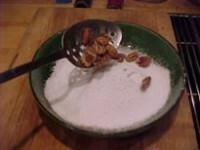 Carefully, lift the nuts out of the sugar mixture with a sieve. 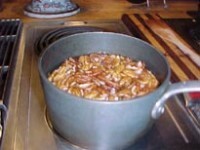 Heat the oil to 375 degrees in a deep-fat fryer or cast iron skillet and fry the nuts until golden and crisp. Drain them in a cookie sheet, not paper towels. 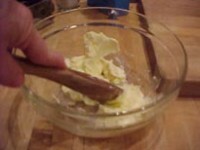 Cream together the butter, salt, and the confectioners sugar until very light and fluffy. 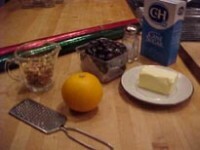 Add the orange rind and the walnuts and a little brandy if you wish. 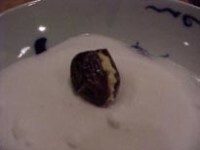 (You may need a little more sugar if you use brandy.) 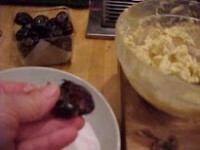 Make a slit in each date, fill each date with this butter mixture. 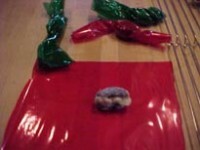 Roll in granulated sugar and allow to dry 4 to 5 hours before storing wrapped in colorful paper.